Ottawa-Glandorf’s Nathan Arrington receives the throw to force out Fort Recovery’s Will Homan at first base during a Thursday Division III district semifinal at Ed Sandy Field in Elida. Ottawa-Glandorf’s Chase Schrieber pitches against Fort Recovery during a Thursday Division III district semifinal game at Ed Sandy Field in Elida. ELIDA — Fort Recovery wasn’t hitting Chase Schreiber’s curve ball so the Indians threw a curve ball of their own when it came to strategy. 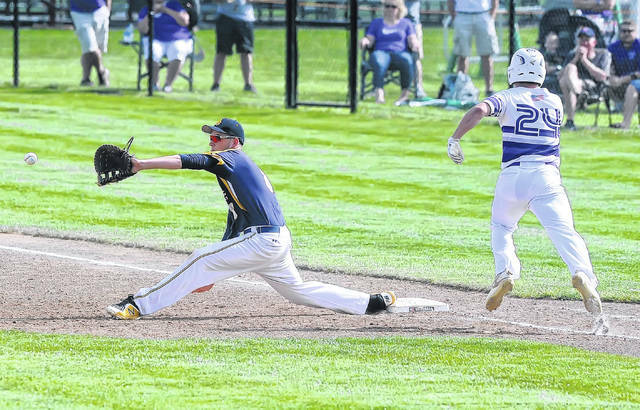 After being held scoreless over the first five innings of a Division III baseball district semifinal against Ottawa-Glandorf on Thursday, they changed up their approach at the plate and put down four bunts in the bottom of the sixth inning to score the only run of the game in a 1-0 win. Two of those bunts went for hits, including the one that drove in the only run. “We’ve used bunts before. I can’t say we rely on bunts. But Schreiber was terrific on the mound. He wasn’t exactly giving us a lot of hits,” Fort Recovery coach Jerry Kaup said. “So we thought maybe we had a better chance of throwing a bunt down than we did any other way,” he said. Fort Recovery (21-4) will play Coldwater (22-6) at 1 p.m. Saturday for the Elida District championship. The Cavaliers rolled over Van Buren 10-2 in Thursday’s other semifinal. Fort Recovery starting pitcher Cade Wendel, reliever Nick Thwaits and Schreiber were dominant. The Titans (14-8) got only two hits in the game — a first-inning single by Mike Bowers and a sixth-inning double by Evan Balash. Fort Recovery had six hits, but half of them came in the sixth inning and two of them never left the infield. Wendel allowed O-G’s two hits, struck out eight and did not walk a batter. The hard-throwing Thwaits closed out the game by striking out the first two hitters he faced in the seventh inning and then getting a ground ball back to the mound. Schreiber struck out five, all in the first four innings, and walked one batter. “The sixth inning proved to be pivotal. 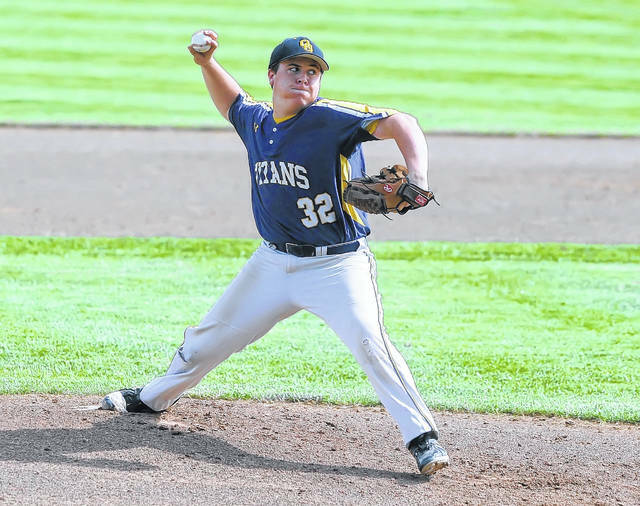 They shut us down with a guy on third with one out and they found a way to get one in,” Ottawa-Glandorf coach Nick Miller said. O-G’s best chance to score came in the top of the sixth when Evan Balash led off with a double and Owen Hiegel sacrificed him to third base. But Wendel got out of the inning with a strikeout and a fly ball to set up his team’s game-winning rally. Riley Post led off the sixth with a single to right field. Wendel followed that with a bunt single and Will Homan’s sacrifice bunt put runners on second and third. After Thwaits was intentionally walked, Reese Rogers’ squeeze bunt scored Post with the game’s only run. The Cavaliers put five runs on the scoreboard in the bottom of the first inning to take control early against Van Buren (18-7). Cole Frilling’s three-run triple was the big hit in the first inning. Nathan Grunden drove in three runs in the sixth inning. Winning pitcher Brad Giere threw a compete game three-hitter with one strikeout and three walks. “We won the state title in 2014 with two guys throwing 80 miles an hour. The bottom line is you’ve got to throw strikes inside, outside and down. That’s what Brad Giere does. Look at his record — he’s got six wins and four saves,” Coldwater coach Brian Harlamert said. The Cavaliers will get a rematch with fellow MAC team Fort Recovery in the district championship game. Fort Recovery won the regular-season game 4-3. This entry was tagged coldwater, fortrecovery, ottawaglandorf. Bookmark the permalink.